The feeling of opening a brand new pair of trainers is one that is only fully understood within certain circles. Lifting the lid, carefully unwrapping the tissue paper, and picking up the shoe for the first time, is like a ritual. I’d be lying if I said the box was as important as the contents, but it is most definitely part of the experience and for me that’s something that hasn’t ever changed and probably won’t. Aside from that, for many collectors the box provides an elegant storage solution. As with almost any collector, there was a single pair of trainers that made me fall in love and start collecting. For me it was the OG Sport red Air Max 1. It wasn’t just the shoe that started it all for me; it was the shoe that started a whole new era of athletic footwear, and subsequently lifestyle footwear. It really was a revolution at the time, and it’s not been forgotten. Since the introduction of Air Max technology, there have been countless updated and evolved models, many of which have again become instant classics. With this evolution of the shoe, has come the evolution of the box it is stored in. With today being Air Max Day, we wanted to take a look at the evolution of the Air Max box itself. As said earlier, the box is unlikely to ever be as impressive or collectible as the contents, but as a designer and a collector it is definitely something of value and interest. This was the box that started it, with the shoe that started it, and for me it perfectly represents what the Air Max was about. With the evolution of the air max range, and in particular the growth in popularity of the series, it’s not purely about performance anymore, but this box still sums it all up. 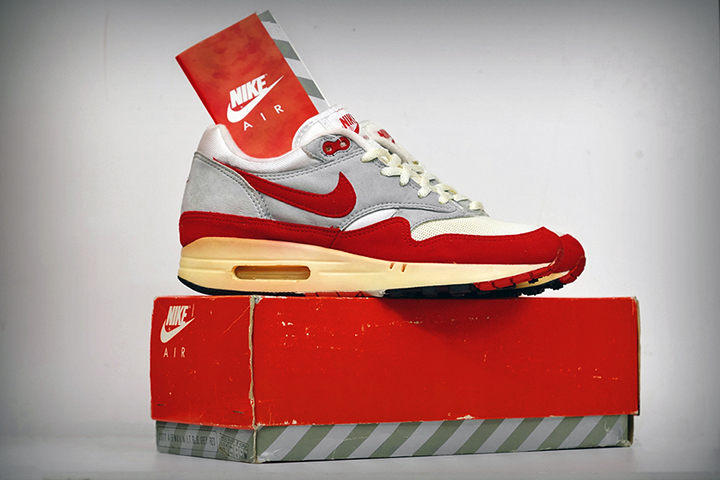 This style of box was used for the next four years, including the releases of the Air Max light and 90, with some small variations. 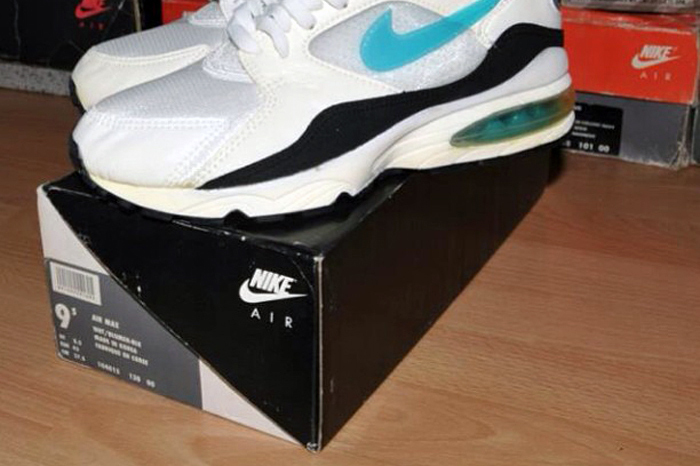 In 1991 however, a new style of box was introduced for the launch of the Air (Max) 180. In 1991 when the Air 180 released, it was the most significant evolution and innovation in the air max series since the original Air Max 1. 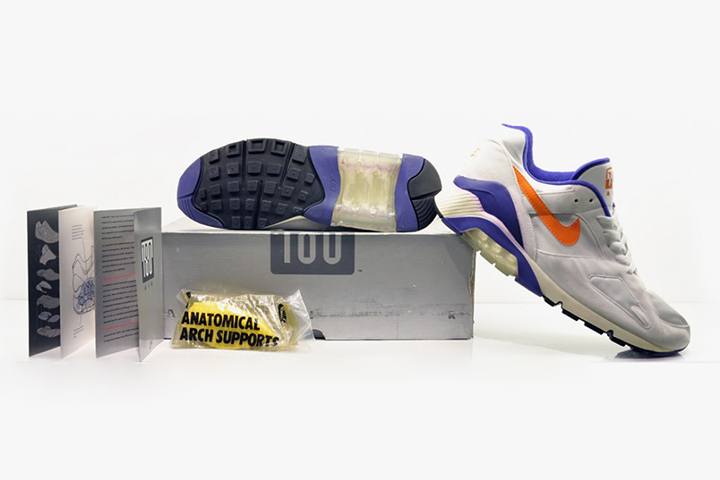 The Air 180 featured a visible air bag that was 50% bigger and wrapped all the way round the sole, 180 degrees from one side to the other. Once again the box for the Air 180 reflected much of the innovation and forward thinking put into the design of the shoe itself. The futuristic nature of the shoe is replicated through the use of silver on the box. The shape of the box had changed significantly as well. Now utilizing a hinged closure, this created a diagonal on either end of the box. However my favourite detail on this box is the way the ‘180’ logo wraps around the top edge of the box. It’s simple but perfectly executed. 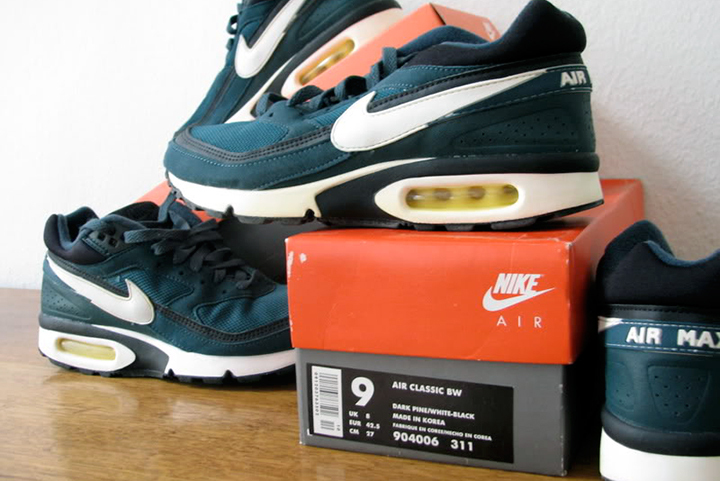 1992 saw the introduction of a new style of Air Max box again, to accompany the additions to the growing Air Max family. The new box clearly took much of it’s inspiration from the original air max box, but featured a more simplistic design. 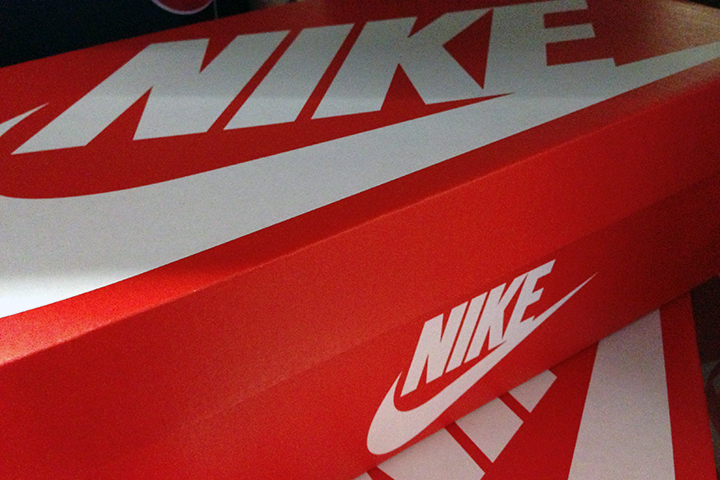 The upper lid of the box used a familiar red or orange as seen in the original Air Max boxes. However the base of the box took on a more minimalist approach, ditching the diagonal pattern used in earlier boxes, for a plain grey colour. The box is still iconic and saw some incredible releases, but in terms of the design and appearance of the box, this version ranks low for me. With the box design now becoming more generic, and with multiple styles available in the same style box, 1993 saw the release of another new style. The Air Max 93 utilized a full wraparound air unit on the heel as well as a neoprene sock not dissimilar to that of the Huarache. With the release of the shoe came another new box design, featuring a similar hinged opening to that of the Air 180 box. The box design was simple, with a black and white split created by the diagonal on either end. 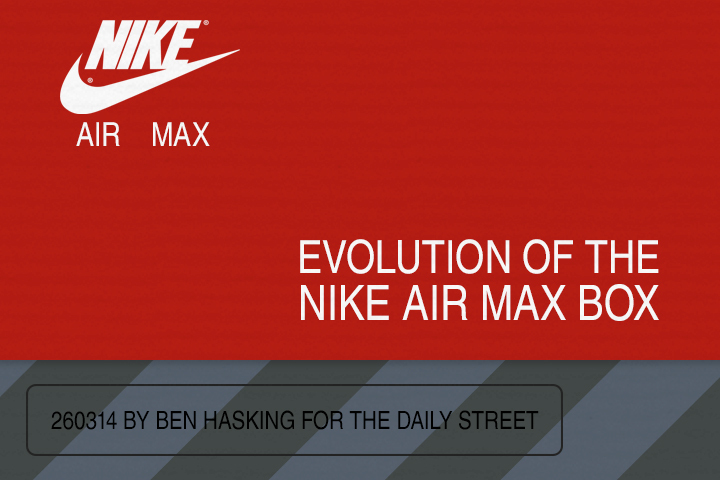 Over the next four or five years, Nike predominantly used one style of Air Max box as originally introduced in 1994. The new box was a departure from previous designs. While the ends and sides of the box maintained a little consistency, working with a block red top and now using a black base, the top of the box now used a raw cardboard. This box featured hits of branding throughout, with a large swoosh on top, ‘Just Do It’ down the side, and other constant reminders throughout. This box holds a special place in my heart as being the first box I can genuinely remember. I remember being bought Nikes as a child and them coming in this style of box. I probably didn’t attach any significance to it at the time but now it is particularly memorable. This style of box was used for the majority of releases up until around ’98/’99. In 1995 Nike pushed the boat out once again with one of the more radical Air Max designs. The design of the Air Max 95 was probably more extreme aesthetically than any of the previous incarnations of the Air Max series. 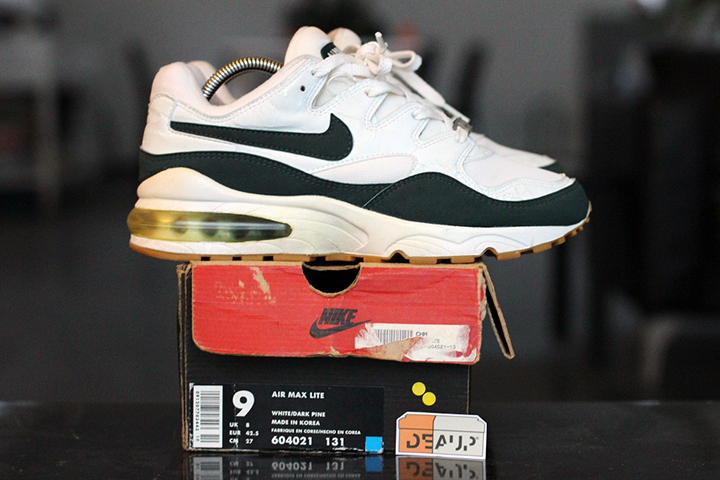 The 95 was also the first Air Max shoe to feature visible air in the forefoot area of the sole. As with the 180, the 95 received it’s own specially designed box, in keeping with the design of the shoe. The box comes complete in the original ‘Neon’ colourway, featuring shades of grey with bold white and neon type along the side of the box. The type, although simple, is clever as well, with the ‘r’ and ‘m’ of Air Max cleverly linked. 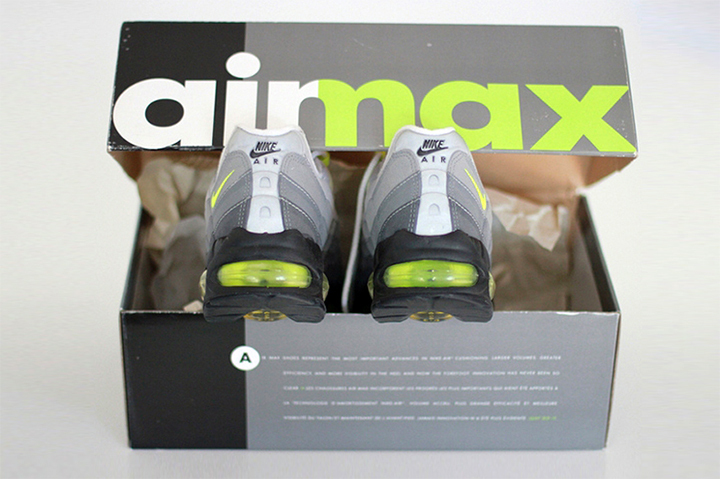 Around the year 2000 Nike introduced what is for me one of my favourite Air Max boxes. Not just because of the box itself, but because of the range of Air Max releases this box housed. Nike used this box for around 6 years and in that time there were some incredible releases. For a start, it was the box that saw the release of the first ever Air Max 1 collaboration, released in 2002 with Atmos. The design of the box is radically different from anything that had come before it. The designers opted for a bright orange and raw cardboard finish with a grey stripe separating the two colours and the orange section of the box featured a subtle tonal pattern. Looking back now the whole design is very much of the time and that late ’90s design only adds to the sense of nostalgia. 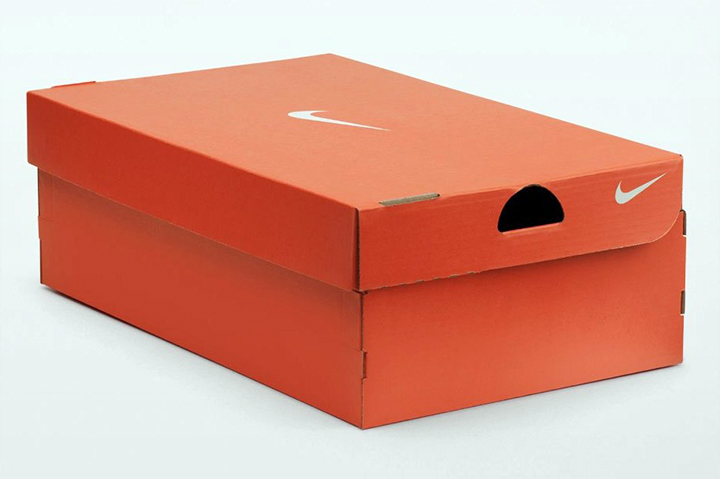 Nike simplified the design of the Air Max box significantly around the year 2006, introducing a completely orange box. The box design was incredibly simple, but this was also why it is so iconic and memorable. There’s simply nothing to forget about it. 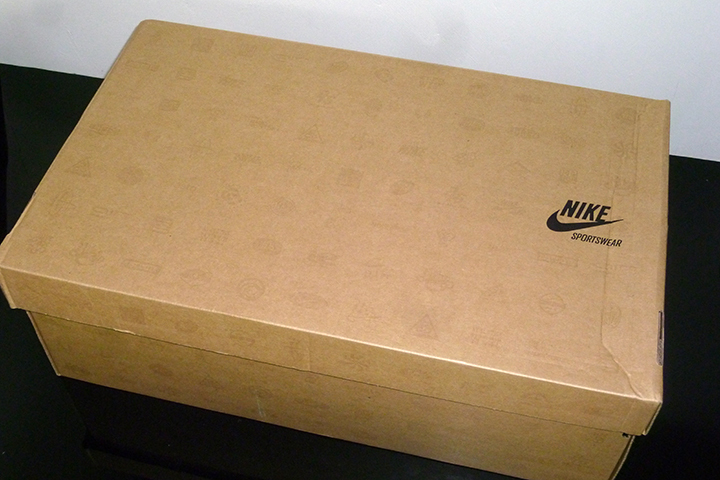 Originally the box was used for a variety of releases, covering both performance and lifestyle, however in late 2008 Nike launched the Sportswear sub-brand and with it, a whole new style of box. The orange box continued to be used for performance footwear and sports releases, however all lifestyle releases now fell under the Sportswear umbrella and therefore a new box. In late 2008, Nike launched the Sportswear sub-brand. Along with an extensive new apparel line that has gone from strength to strength, new boxes were designed to cover lifestyle footwear. The sportswear side of the brand provided a more suitable place for retro reissues, hybrids and lifestyle specific releases. The design of the box was simple and elegant, featuring a raw cardboard finish with a subtle all-over print. The print itself pays homage to various departments of the Nike brand that could now fall under the Sportswear brand. The logos for each of these departments are all tonally printed in a grid-like pattern all over the box. While this box isn’t as iconic as some, I have a certain affinity with it as a large portion of my collection are in this style of box, as is most likely the case with the majority of collectors today. 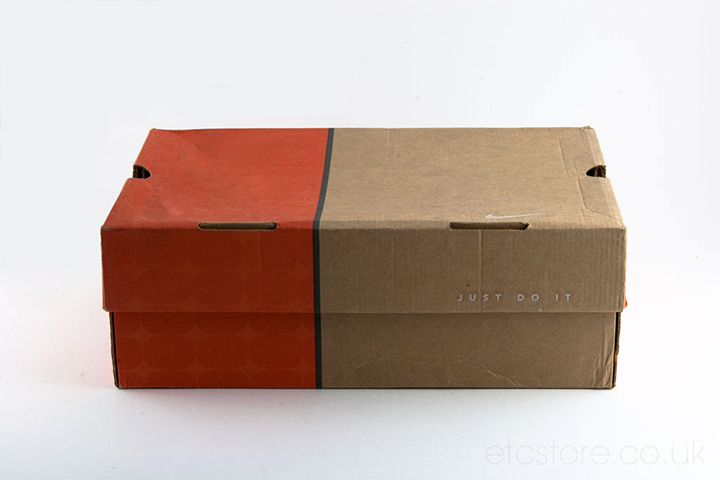 The raw cardboard Sportswear box was used up until 2013 when it was replaced (to much excitement) with an all-over red box with a huge Nike Swoosh logo on the top. The red box has a real retro feel to it, and feels like a nod to the boxes of the past, but really it’s success is it’s simplicity. It’s only been in use for about a year and is still being used alongside the orange box, but it will be interesting to see how long this design lasts. For me, what is more interesting is whether Nike will ever revert to or pay more direct homage to the original Air Max box… We’ll have to wait and see what the future holds for the Air Max box. Ben is a professional graphic designer and teacher. Head honcho behind Bake Designs, Ben is firmly rooted in the UK streetwear scene. Outside of design and streetwear, he has an extensive knowledge of sneakers.